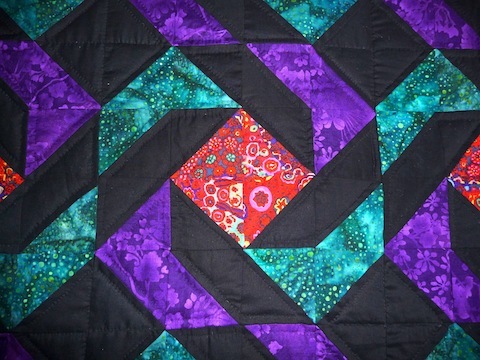 Here is our first Amish Arachnes quilt made almost entirely of batik print fabrics (except for a foundation/skeleton of true black). 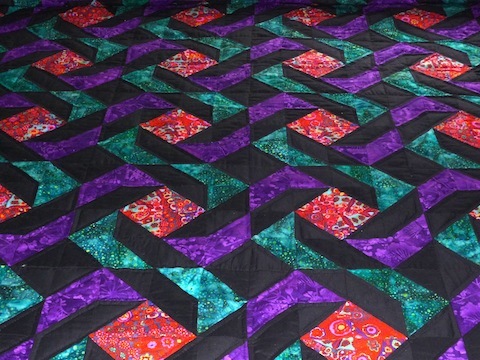 What an outcome: the dimensionality, depth and movement in this quilt is incredible. 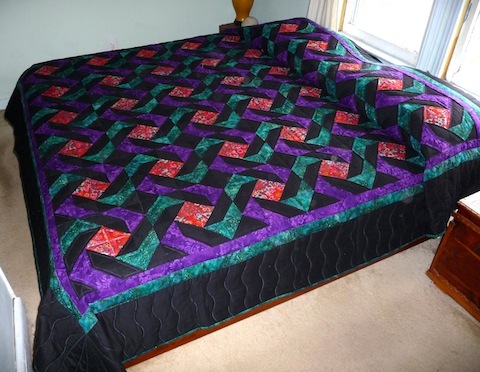 We’ve never seen a quilt like this, and we’re proud of the Amish quilter who made it. 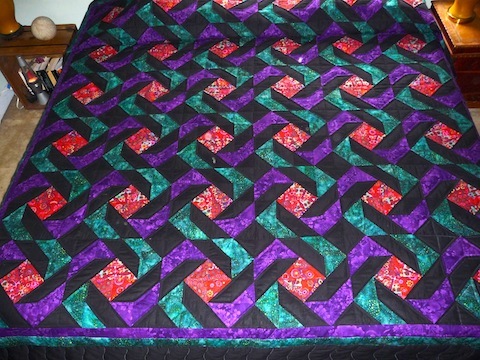 It was difficult to capture this quilt in photos. In order to get a better idea of the fabrics used be sure to take a moment and look at the close up photos. 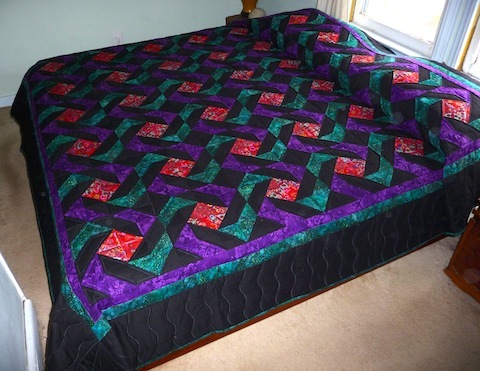 This quilt pattern changes, depending upon how you look at it. It can be seen as flowers with four or eight petals, or, one is reminded of a large flock of blackbirds taking off or settling in a tree. Sometimes it looks like migrating butterflies. 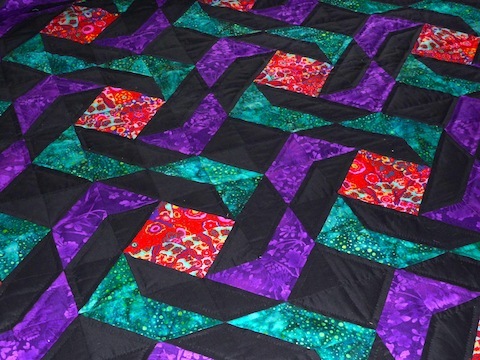 The piecing is gorgeous. The pattern is made of nothing but small triangles! 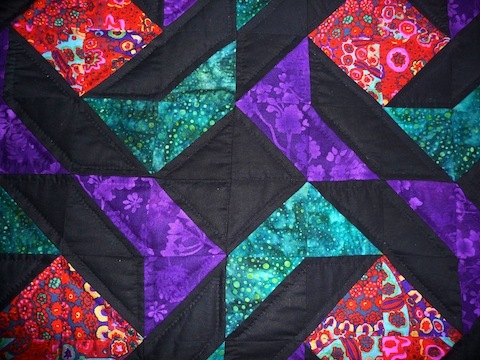 The sharp contrast between dark and light and between prints and colors imbues this quilt with its unique interchange of negative and positive spaces. The basketlike weave is very prominent: this quilt pattern is called Arachne’s Quilt after the master weaver who, in Greco-Roman mythology, challenged Athena to a weaving contest. For this hubris, Arachne was changed into a spider: the greatest weaver of all.